← Why Can’t Anti-Monarchists Get the Basic Facts Right? The Globe and Mail prides itself as the paper of record in Canada, much like The Times of London for the United Kingdom, and it is not an undeserved appellation. The Globe and Mail’s and Globe’s archives provide an excellent historical resource for the daily goings on of the Province of Canada and Dominion of Canada from 1844 onward. Like almost all newspapers of the 19th century, George Brown founded The Globe in order to advance ideas and principles — in this case, Whiggish, or classical liberal, ideas like Responsible Government and Representation by Population. The paper supported the Clear Grits and, later, the Liberal Party, and indeed, George Brown was himself a Liberal MP. On the sesquicentennial of Confederation, the Globe and Mail released for its subscribers the edition of The Globe which appeared on 1 July 1867. George Brown had written a 9,000-word essay on the history of British North America from 1791 to 1867 and what Confederation would achieve. Brown referred to 1 July 1867 — but not 1 July in general — as “Confederation Day.” Official recognition for our national day came later, in 1879, when Parliament first enacted “Dominion Day” into statute, after it had already gained popularity informally and by convention. Brown’s essay in The Globe hearkens to his contributions to the Confederation Debates themselves, particularly in how he articulated a Canadian equivalent to American “Manifest Destiny” and similarly saw the Dominion of Canada as vehicle for turning British North America into a trans-continental three-ocean country — though perhaps Canada’s destiny was slightly less obvious (i.e, manifest) than America’s. 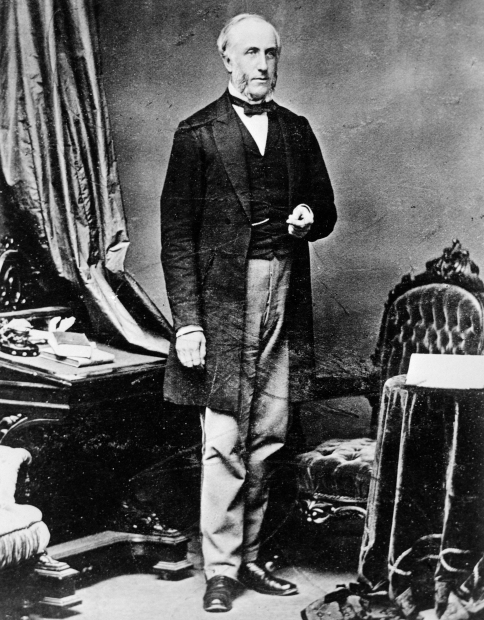 George Brown gave his most prominent and famous speech of the Confederation Debates on 8 February 1865, as one part of the tri-partite Grand Coalition that also included Sir John A. Macdonald and George-Etienne Cartier. He outlined a grand vision for what a federal union of British North America could achieve, namely a country that could rival the United States in attracting European settlers. Our scheme is to establish a government that will seek to turn the tide of European emigration into this northern half of the American continent — that will strive to develop its great natural resources — and that will endeavour to maintain liberty, and justice, and Christianity throughout the land. Sir, the whole great ends of this Confederation may not be realized in the lifetime of many who now hear me. We imagine now that such a structure can be built in a month or in a year. What we propose now is but to lay the foundations of the structure — to set in motion the governmental machinery that will one day, we trust, extend from the Atlantic to the Pacific. The history of Old Canada, with its contracted bounds and limited divisions of Upper and Lower, West and East, has been completed, and this day a new volume is opened, New Brunswick and Nova Scotia uniting with Ontario and Quebec, to make the history of a greater Canada, already extending from the [Atlantic] ocean to the headwaters of the Great Lakes, and destined ere long to embrace the larger half of this North American Continent from the Atlantic to the Pacific. But Brown did not content himself with lofty pronouncements alone. He also advocated specific, realistic, achievable policies through which the future federal government could turn the Dominion of Canada into a trans-continental country, namely through building infrastructure, attracting mass immigration, and settling those immigrants in homesteads. And this is precisely what the Macdonald and Laurier governments did: Macdonald fulfilled British Columbia’s Terms of Union and shepherded construction of the Canadian Pacific Railway (even after his false start in 1873 and the Pacific Scandal which brought down his penultimate ministry that November), which, in turn, paved the way for the Dominion Lands Act of 1872, a direct Canadian equivalent of, and counter-weight to, the American Homestead Act of 1862; Laurier continued and perfected these policies, commissioning the construction of two additional trans-continental railways, and, along with his able Minister, Clifford Sifton, attracted hundreds of thousands more immigrants to settle the Prairie Provinces, two of which Parliament created under his watch in 1905. George Brown himself had clearly set out these policies in this speech in 1865. He pointed out that Canada already boasted public works (what we would today call infrastructure) far superior to that of the United States at its Union, partially, of course, because of technological advances but also because of deliberate policy. Sadly, one of Brown’s predictions did not come to fruition as it should have: free trade between the provinces. “I go heartily for the union, because it will throw down the barriers of trade and give us control of a market of four millions of people.” If only that were so. Then we would not need the Agreement on Internal Trade of 1995, the Canada New West Partnership (originally the TILMA of 2003), or the Canadian Free Trade Agreement of 2017. Nor would the Supreme Court need, in 2017, to adjudicate on laws which are almost certainly unconstitutional because they prohibit the free trade of alcohol between provinces. You can read Brown’s speech of February 1865 in full at the Macdonald-Laurier Institute’s website. The fourth clause of the preamble of the British North America Act, 1867 says, “And whereas it is expedient that Provision be made for the eventual Admission into the Union of other Parts of British North America.” Section 146 then provides for the eventual admission of Newfoundland, Prince Edward Island, Rupert’s Land, the North-western Territory, and British Columbia into the Union. Imperial Orders-in-Council transferred British Columbia and Prince Edward Island to the Dominion of Canada in 1871 and 1873, respectively. An Imperial Order-in-Council in 1870 transferred both Rupert’s Land and the North-western Territory to the Dominion of Canada, and another Imperial Order-in-Council from 1880 then completed the annexation of all other “British possessions and Territories in North America and islands adjacent thereto” (i.e., the Arctic Archipelago) to the Dominion of Canada. These territories gave rise to the northern parts of Quebec and Ontario, as well as all of Manitoba, Saskatchewan, Alberta, Yukon, the Northwest Territories, and Nunavut. The Parliament of Canada legislated Manitoba into existence in 1870, and it also carved Saskatchewan and Alberta out of the Northwest Territories in 1905. Newfoundland and Labrador then joined the Union in 1949 in accordance with an amendment to the British North America Act passed by the Westminster Parliament. All of the aforesaid Imperial Orders-in-Council and statutes and Canadian statutes ultimately flowed from the authority of section 146; they now form part of the Constitution of Canada and are enumerated in the schedule to the Constitution Acts. 90. The following Provisions of this Act respecting the Parliament of Canada, namely, — the Provisions relating to Appropriation and Tax Bills, the Recommendation of Money Votes, the Assent to Bills, the Disallowance of Acts, and the Signification of Pleasure on Bills reserved, — shall extend and apply to the Legislatures of the several Provinces […]. Section 90 guarantees all provinces the blessings of Responsible Government, without which no province could exercise its jurisdiction and heads of legislative power contained in section 92 of the British North America Act; instead, they would be reduced to a territory administered by a Commissioner appointed by the federal government. While the federal executive and the Parliament of Canada can and have granted the three modern territories heads of legislative power and Responsible Government or Consensus Government, these are devolved authorities, akin to the devolved assemblies in Scotland and Wales and are neither constitutionally entrenched nor guaranteed like the authority and heads of power of the provinces. This principle, whereby the British North America Act spread an ideological guarantee to all British North America, is most readily demonstrated in the Terms of Union of British Columbia and Newfoundland and Labrador. Since British Columbia had not been granted Responsible Government by the Colonial Office before Confederation, its Terms of Union specified that it should achieve Responsible Government soon after Confederation in 1871. The Macdonald government then reiterated and operationalised this pledge in the letters and instructions issued to the first Lieutenant-Governor of British Columbia. Similarly, Newfoundland and Labrador’s Terms of Union restored Responsible Government, which had been in abeyance since 1934, as a condition of joining Confederation in 1949. Indeed, Brown was also a newspaper editor and proprietor himself and almost certainly knew of O’Sullivan; he also followed American politics keenly. However, neither O’Sullivan nor Brown founded the concept expressed within Manifest Destiny. Americans tend to think of their history of settlement as unique — dare I say, exceptional? — but it is not. American Manifest Destiny is merely a sub-set of an over-arching Imperial ethos — “the civilizing mission” as the British and French then called it, and the “muscular Christianity”, as it was often called, of the era — shared by white settler populations in all European empires throughout the 19th century. The brand of manifest destiny that O’Sullivan and Brown expressed also corresponds to the Second Great Awakening in the United States and a broader evangelical Protestant revivalism throughout the English-speaking world during the Victorian Era. America was and is no different. This mid-19th century trend was spurred by the Industrial Revolution in general and George Stephenson’s steam-engine locomotive and railway in particular, which provided a means of opening up and settling North America and Australia at rapid rates unthinkable in the pre-industrial 18th century. Incidentally, if you read through Brown’s essay, or if any of you have, more generally, ever done archival research on newspapers of the 19th and early 20th centuries (say, before 1940), you would plainly see that the sorts of posts that I write on this blog were found in the 19th and early 20th centuries in daily newspapers or weekly magazines — and newspaper editors of the era would not have forced writers like me to dumb down their work to a 6th-grade reading level or shorten their pieces to 500 meaningless words. What happened? In the 1950s, newspapers started putting in more and larger graphics and photos, around the same time that television started gaining ground; one thinks here of McLuhan and Postman and can’t help but posit a causal relationship between the two trends. If newspapers had imposed this sort of mediocrity as the norm in the 19th century, then we would not today be able to enjoy and benefit from Brown’s contribution to history. Janet Ajzenstat, Paul Romney, Ian Gentles, and William D. Gairdner, editors, Canada’s Founding Debates (Toronto: University of Toronto Press, 2003), 133. George Brown, “Confederation Day: The Dominion of Canada — Historical Notes, How Confederation Has Been Brought About, Statistics of the United Provinces,” The Globe, volume 24, no. 156, 1 July 1867. Janet Ajzenstat, Paul Romney, Ian Gentles, and William D. Gairdner, editors, Canada’s Founding Debates (Toronto: University of Toronto Press, 2003), 134-136. Janet Ajzenstat, Paul Romney, Ian Gentles, and William D. Gairdner, editors, Canada’s Founding Debates (Toronto: University of Toronto Press, 2003), 134. Peter Hogg, Constitutional Law of Canada, 2nd Edition (Toronto: The Carswell Company, 1985), 31. Schedule to the Constitution Act, 1982. United States Constitution, Article IV, Section 4. And by “United States,” the section means the federal order of government in Washington, D.C.
 Janet Ajzenstat, The Once and Future Canadian Democracy: An Essay in Political Thought (McGill-Queen’s University Press, 2003), 65-67; Dennis Baker, “‘The Real Protection of the People’: The Royal Recommendation and Responsible Government,” Journal of Parliamentary and Political Law 4 (2010); John Lambton (The Earl of Durham), The Report and Despatches of the Earl of Durham, Her Majesty’s High Commissioner and Governor-General of British North America (London: Ridgways, 1839), 74. Janet Ajzenstat, Paul Romney, Ian Gentles, and William D. Gairdner, editors, Canada’s Founding Debates (Toronto: University of Toronto Press, 2003), 71. Janet Ajzenstat, Paul Romney, Ian Gentles, and William D. Gairdner, editors, Canada’s Founding Debates (Toronto: University of Toronto Press, 2003), 32-35, 32N, 35N. Maurice Ollivier, “British Columbia’s Terms of Union,” in British North America Acts and Selected Statutes, 1867-1962 (Ottawa: Parliament of Canada, 1962), 178. Peter Hogg, Constitutional Law of Canada, 2nd Edition (Toronto: The Carswell Company, 1985), 33. Peter Hogg, Constitutional Law of Canada, 2nd Edition (Toronto: The Carswell Company, 1985), 35; Maurice Ollivier, “Terms of Union of Newfoundland With Canada Act,” in British North America Acts and Selected Statutes, 1867-1962 (Ottawa: Parliament of Canada, 1962), 247. I like the comment about the declining standards of newspapers and the fact that nothing as interesting and worthwhile as Brown’s writings (or yours) would ever appear in his newspaper today. The last bit about manifest destiny made me think (very tangentially) of a book that I once read, which you might appreciate as well, called “The Mingling of the Canadian and American Peoples” (Yale, 1940) by Marcus Lee Hansen and J. B. Brebner. It is a very good account of how the expansion of European settlement across North America included extensive Canadian emigration into the southern and western U.S. as well as equally heavy U.S. emigration into the Canadas and, later, into the Prairies. This makes for a very interesting history of North America (as such) that doesn’t read anything more into the boundary between the two halves than the historical reality allows for. Thinking of the past in this way, one might (with some exaggeration, obviously) posit that there really was a single manifest destiny and that the two countries didn’t completely emerge, in their current and quite marked psychological duality, until after settlement was complete. That’s very interesting. I’m not familiar with Hansen’s book, but I knew that many of the settler’s from Laurier’s premiership were Americans, and I recall from Professor McDowell’s course in Canadian history that European immigrants sometimes used Canada as a conduit to enter the United States. This is why had always tried, until the Pearson-Trudeau Era, to keep our taxes lower than those in the US, to increase our competitiveness.